The challenges, to strive for innovation and the desire to improve never end at Campagnolo. Just like a long stage race, after reaching the finishing line, another goal lies ahead. After two years, the 11-speed revolution has evolved always maintaining the same objective: achieving ever better performances. The team of professional racers and enthusiasts who over the last two years have been riding 11-speed groupsets, and the great work carried out by Campy Tech Lab™ engineers has enabled us, to raise the bar and reach another goal: Improving products that already represent a benchmark on the market. Revolution11 – Racing Evolution is the result of technical refinements that have led the 11-speed drivetrains to obtain shifting performances like never before and lose weight, thanks to special materials and innovative technical solutions. 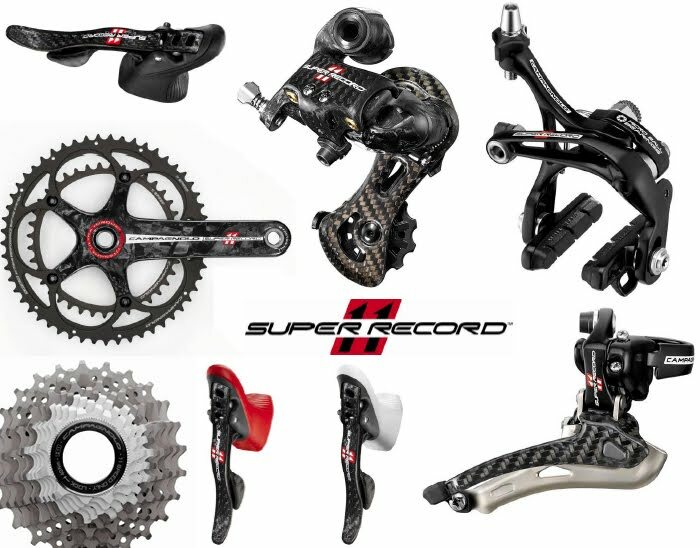 The new Super Record™, Record™, Chorus™ and Athena™ groupsets mark a big step forward and represent the highest performance level ever reached: Incredible precision in front and rear shifting, maximum smoothness, extreme lightness, reliability and an aggressive design. Revolution11-Racing Evolution is our promise and will be the banner under which you will be able to experience the emotion of testing Campagnolo’s new groupsets and verify yourself that “The world’s finest groupsets just got better”. The whole new groupset weighs less than 1,900 grams and it includes components forged using state-of-the-art materials like carbon fiber and titanium. It is the most aggressive and best performing groupset ever built. Super Record™ 2011: an uncomfortable position for your opponents, with a transmission system that your competition will worship and fear, as you’ll always be ready to overtake, break away and take the lead. SUPER RECORD™ ULTRA-TORQUE™ ST 11S crankset – Shifting to “higher quality”; the new chainrings have 8 pins to lift the chain and 2 to lower it. This whole re-designed system makes shifting from one chainring to the other very fast and efficient. Featuring full-carbon unidirectional-multidirectional cranks, Ultra- Hollow™ Structure, light alloy chainrings with XPSS™, CULT™ bearings, integrated ULTRA-TORQUE™ semi-axles. 11s RECORD™ Chain – Pros are the everyday testing ground for the chain fitted on all advanced Record™ 11 and Super Record™ 11 groups. Featuring Ultra-Link™ chain link locking system, Ultra-Shift™ chain links, Ni-PTFE anti-friction treatment, links made of special steel. Ultra-Torque™ OS-Fit™ Integrated Cups – Integrated Cups: The Campagnolo® solution for oversize BB30 and 86,5×41 bottom brackets. SUPER RECORD™ 11S REAR DERAILLEUR – The masterpiece of the 2011 Campagnolo® model range! Speed, precision, smoothness and better looks: the first rear derailleur with carbon fibre upper and lower body will amaze even the most demanding of cyclists. Featuring Titanium hanger and pivot bolt, carbon fiber forged aluminium upper and lower body, metal-carbon cage, lightened special rubber pulleys, bottom pulley with ceramic bearings. SUPER RECORD™ SKELETON™ brakes – For a fast descent you need a safe and reliable braking system that is powerful and adjustable. Featuring brake-pad height adjustment ratio: 40÷50 mm, ball bearings, light alloy and titanium hardware, brake pads orbital adjustment, lightened rear brake, special pad compound. SUPER RECORD™ 11S sprockets – Maximum performance and low noise with no compromise on components. With this in mind Campagnolo® engineers designed our Super Record™ sprockets with double frame on the last two sprocket triplets. Featuring 5 steel and 6 titanium, nickel-chromed finish for steel sprockets, light alloy carrier, light alloy supports for the final two triplets, 11s light alloy lockring. Place your bet on red 11 and you have won before starting the race! The new eye-catching design highlights the upgrades done on all our groupset components: controls, derailleurs, crankset and sprocket set are more precise, they perform better and have our unique Italian design. RECORD™ ULTRA-TORQUE™ ST 11s crankset – Red and white colors will immediately gain your attention, but the real surprise comes with the first shift; precise, extremely fast and with no hesitation. Featuring full-carbon unidirectional-multidirectional cranks, hollow cranks (Ultra- Hollow™ Structure), light alloy chainrings with XPSS™, USB™ bearings, ULTRA-TORQUE™ semi-axles. Ergopower™ Ultra-Shift™ RECORD™ Controls 11s – Improved details to enhance control performance. Featuring Ultra-Shift ™ geometry, ergonomic brake lever with high fulcrum, closer brake lever, Vari-Cushion™ silicone hoods, No-Bulge™ housing path, minimum friction housings. RECORD™ rear derailleur 11s – It’s the soul of the new 11S Record™ transmission! Featuring black anodized forged aluminium upper and lower body, metal-carbon cage, lightened special rubber pulleys, ceramic ball bushings. RECORD™ 11s front derailleur – It is one of the essential components – together with the chainrings and the cassette – of the exceptional Record™ 2011 groupset. Featuring composite and aluminum fork, M-brace™ body, Even-O™ clamp, Z-shape™ lower cage, antifriction treatment. RECORD™ D SKELETON™ brakes – Following professional cyclists means meeting all their needs. This is why Campagnolo® has designed two Record™ brake options. Featuring brake-pad height adjustment ratio: 40÷50mm, ball bearings, light alloy hardware, brake pads orbital adjustment, lightened rear brake, special pad compound. RECORD™ 11s sprockets – In competition every little detail counts; that´s why steel and titanium were used when producing Record™ sprockets. Featuring Ultra-Shift™ teeth design, Nickel-Chrome surface treatment, Support frame for 2nd and 3rd sprocket triplet, Ultra-Shift™ sprocket synchronization, 3 titanium sprockets. It’s hard to resist the allure of carbon fiber. That is why Campagnolo® has designed the all new Chorus™ groupset, making it more aggressive and with even better performance, reaching top-of-the-line levels. With its attractive looks and new logo, the Chorus™ 2011 groupset will uniquely make you stand out from the pack and will always be at your side in every challenge, be it against others or against yourself. 11s CHORUS™ Chain – Fluidity, smoothness, and noise reduction: the 5.5mm Chorus™ chain fully meets the quality and performance standards of the 11-speed™ groupsets. Featuring Ultra-Link™ chain link locking system, Ultra-Shift™ chain links, Ni-PTFE anti-friction treatment, links made of special steel. CHORUS™ rear derailleur 11S – Chorus™ 11-speed’s shifting precision is comparable to its older siblings Record™ and Super Record™. Featuring black anodized forged aluminium upper body, lightened special rubber pulleys. CHORUS™ 11s front derailleur – This system is fast, responsive, and precise, and the chain shifts across chainrings with no hesitations. Featuring light alloy fork with antifriction treatment, M-brace™ body, Even-O™ clamp, Z-shape™ lower cage. 11s CHORUS™ SKELETON™ brakes – The new compounds dramatically improve braking, and the new lighter pad holders make replacement easier and faster. Featuring brake-pad height adjustment ratio: 40÷50mm, brake pads orbital adjustment, lightened rear brake, special pad compound. CHORUS™ 11s sprockets – Every sprocket tooth has been designed to achieve the maximum synchronization, shifting speed, and silent operation. Featuring steel nickel-chromed finish, light alloy supports for the final two triplets, 11s light alloy lockring. Campy Bora One Wheelset @ MRSP “$2800”, SR 2011 Groupset @ MRSP “$3300″…. Price mentioned are before discount. may i knw the price for the campag record and chorus? Campy record is retail @ $2450, and Chorus is retail @ $1950. Price quoted inclusive of installation fee. Hi there, which groupset do you recommend for eddy merckx 3-Athlete steel road bike? Currently, it is using shimano 600, with downtube shifters. Thanks! Do u have centaur for sale? how much is it?